During the early morning of February 17, 2015, Lauren Camille Jones, an 18-year-old student at the University of Oregon, was taken emergently to the Sacred Heart Medical Center University District with a fever of over 103 degrees, anxiety, chills, shakes and spasms in her lower back. She was seen by an emergency room doctor, given Tylenol and ibuprofen, and discharged with instructions to continue taking these medications and to drink lots of water. At noon the next day, Jones was found unconscious in her dorm room and pronounced dead just hours later due to a deadly bacterial infection – meningococcal disease. Jones’s mother has filed a lawsuit against the hospital for failing to recognize the signs and symptoms of meningococcal disease, instead writing it off as a flu-like illness. Additionally, the lawsuit claims that the hospital failed to order a CBC (complete blood count) test and to administer antibiotics that would have saved Jones. Meningococcal disease causes inflammation of soft tissues surrounding the brain and spinal cord (meninges) and requires quick treatment to prevent serious injury and death. Six other students had been diagnosed with meningococcal disease at the University since 2015, but Jones was the only one to die. 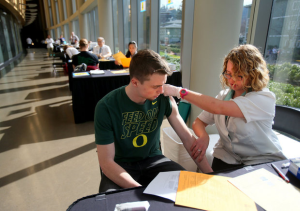 The University is now on a campaign to immunize students against the disease and is offering clinics with vaccinations. The lawsuit seeks damages for Jones’s pain and suffering, economic damages, and loss of society, love, and companionship for her parents. Read the full article at OregonLive.com.